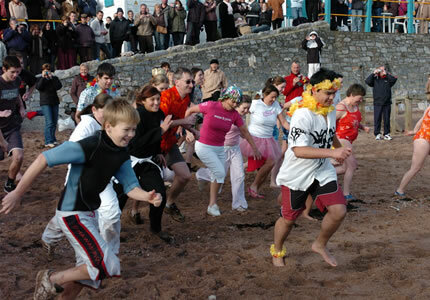 The Boxing Day Dip is an annual event organized by No. 200 (Torquay) Squadron Air Training Corps and is enjoyed by both its members and the general public. Participants are sponsored to take part in aid of raising funds for the unit as well as an additional chosen charity. The charity selected for this year is National Society for the Prevention of Cruelty to Children (NSPCC) and proceeds are divided 50% between both organisations. A donation also goes towards the Royal National Lifeboat Institution (RNLI) for their support in making the event possible. The Dip will take place from Torre Abbey Sands, Torquay on Wednesday 26th December 2018. Participants and supporters should aim to arrive for 10.30am ready to enter the sea at 11.00am. Tasteful fancy dress is encouraged. There is no cost to get involved for participants or to just come along to support your local Air Cadet Squadron. If you would like to join in a Sponsorship form can be downloaded from the Squadron Website resources section. We would encourage any spectators to donate any spare change they may have into one of the collection buckets held by our volunteers on the day. Page last updated 11 December 2018.